Last month,?I wrote about the make-believe economics?of the movie industry that people use to convince themselves to cast actors who are white, and avoid actors who aren?t. The diversity issue is particularly annoying because as much as the movie industry has reinforced racial and gender stereotypes, and it has, films have also pushed audiences to important social change. But diversity casting is often challenged based on a common misconception among my industry colleagues. Here?s a true story from earlier in this decade when I was approaching a well-known sales company about representing a film I was putting together. I gave them a list of the actors we could consider for starring roles. They were not all white. ?You can?t cast these people,? the sales agent said, crossing the black actors off the list. ?We can?t sell them overseas.? ?What about Will Smith?? I asked. ?Will would be OK. He?s not black,? the agent said. Racism in Hollywood is rarely that overt. But, as I wrote, ?The lack of overt racism, like so much in the entertainment business, is an illusion. I have never had financiers or producers tell me they only want to cast white actors. Instead, they couch their racism in economic terms, explaining that the movie business is, first and foremost, a business.? In my article I used historic box office performance numbers to dispell the myth that only white actors do well at the international box office. 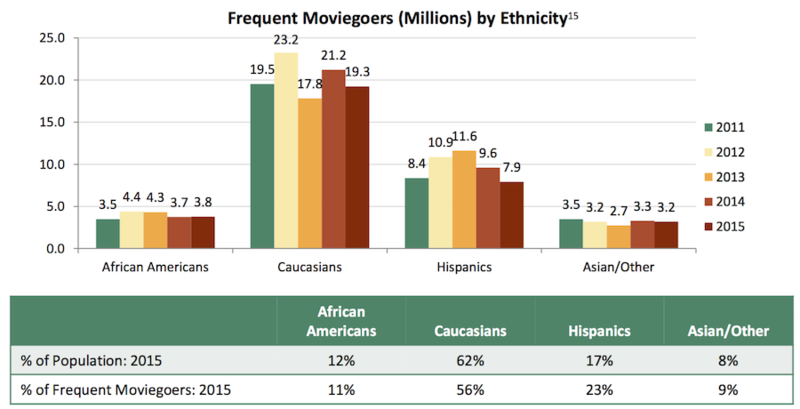 Now there?s data to drive the conclusion further: diversity can be a key component of box office success. This week I attended CinemaCon, the annual convention of theatre owners, where Chris Dodd, CEO of the?Motion Picture Association of America, and John Fithian, CEO of the?National Association of Theatre Owners, presented their state of the industry reports. Movies have had a record-breaking year, grossing $38.3 billion worldwide and $11.1 billion domestic. Globalization has its upside, and the expansion of international markets bodes well for diversity casting. ?Furious 7,?with its diverse cast, grossed $351 million domestic and an astounding $1.16 billion international. As John Fithian said, ?When movies look like the world, the world goes to the movies.? ?Hispanics are more likely than any other ethnic group to purchase movie tickets (23%) relative to their share of the population (17%).? Let?s be clear. When it comes to social justice, money cannot and should not be our guide. There are far more important reasons than money to cast movies in a way that represents society. In fact, we should use the beautiful medium of film to represent barrier-free images of people of all ethnicities and genders. Movies are often about the way we want the world to be, and we should not pander to audiences. But in this instance, the audience ? global, rainbow-hued, and hungry for great entertainment ? is there and they are right. When the false economics of racism fall, we?ll all make better movies. Top image from Furious 7, courtesy Universal Pictures. Headline with apologies to the legacy of Nikki Finke, Deadline.